When I made the leap from employee to entrepreneur over a decade ago, I relied on my network of contacts to find new copywriting and marketing clients. Ten years later, most of my new business still comes from referrals from happy clients and my business network. Yes, I built a good referral-based business—but it wasn’t easy. I now know that I did everything the hard way when it came to asking for referrals. Want to do it the easy way? Get yourself a copy of Endless Referrals by Bob Burg, the best-selling author of The Go-Giver series of business books. Need a jump-start? 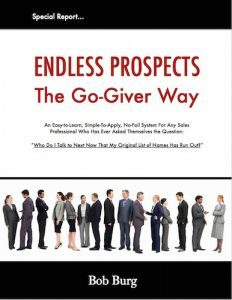 Here’s a great free resource: Endless Prospects the Go-Giver Way! No opt-in is required. If you’d like to say thanks, please give me a “like” or a shout-out on my Facebook page.